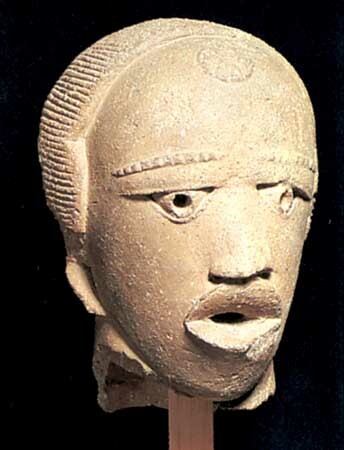 The two major categories are ritualistic art and craft art, however the category of carft or ‘applied art’ in African thought is not to be distinguished from the original stalk (A.Locke). In Africa things can be beautiful and objects of utility at the same time. The traditional art has never been divorced from the vital context of everyday life; it embodies and vindicates one of the soundest and most basic of aesthetic principles, beauty in use (A.Locke). This clearly points to the functional aspect of the art. The African artist, though a great craftsman and technician is forgetful of self and fully projects himself into the function and tradition of the article he is working on (Locke), exerting a higher force upon a lower. It is by age-long tradition anonymous, reflecting a collective aspect to the work which is generated. The African artist is concentrating upon unrestrained variety and directness of three-dimensional effects, this goes directly to the heart of his task and thus he realizes the distinctive potentialities of sculpture. He produces work comparable in its spiritual severity. “One comes to regard their sculpture not as a distorted copy of natural form, but as a purposeful creation of mass design, with free distortion of nature shaped into highly stylized form expressing abstract design (Locke). There is a emphasis on the essential, consistent three-dimensional organization of structural planes in sequence, truth to material and achieved tension between idea or emotion; expressed through representational and abstract principles (Locke). In short creation in African art is not imitation of nature but free creative improvising on themes taken from nature to convey forcefully a selected mood or and intended idea, all of which is committed from inception to end, to the African metaphysical outlook of life. This overview of the historical aspects of Black art can reaffirm the Cultural Nationalism that is naturally African, that the Black artist of today would achieve. The conventions of modern art may have been redefined through the times of change, yet the intention of communicating with an art that is functional, collective and committed remains basic to the African-American artist. As a member of this research project I want to share a little of my part in Bronzeville’s hidden history. I was a founding member of the Sutherland Community Arts Initiative. 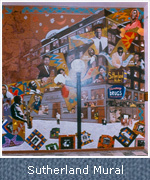 SCAI was the brain child of 4 creative residents of the Sutherland Apartments, located on the corner of 47th & Drexel. Malachi Thompson (musician, composer, band leader, writer) Esete Ray (photographer), Rita Warford (jazz vocalist and musician) and myself, Arlene Turner-Crawford (visual artist) were the initial crew. SCAI’s mission was to preserve, propagate and advance African American art forms and culture through performance, education and exhibition. The founding members of SCAI believed that there existed a strong link between education, arts and culture. That the sounds, images and ideas that African-American artists create are concerned with preserving a heritage and tradition, while at the same time these creative efforts reflect and project our everyday realities. We also believed that when a people feel good about the contributions they make to society, they feel good about themselves. SCAI proposed to use the Arts to establish an ethical attitude towards human existence grounded in time-honored tradition, not just limited to the art world, but to be utilized by the greater community to help develop community pride, cultural tourism and economic growth. I hope to expand further on this history with this project as well as, assist the participants in creating some more Bronzeville cultural history.